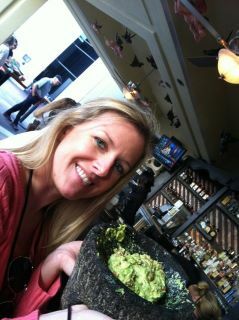 Megan at Rocco’s with the ultimate guacamole! I had the undisputable pleasure of visiting Rocco’s Tacos and Tequila Bar in Ft. Lauderdale, Florida, during a recent visit. If you’re ever in the area, you’ve got to check it out. The food was estupendo, and the guacamole, prepared fresh at your table, was mucho magnífico!!! Add a pitcher of prickly pear margaritas and you’re good to go! I’ve been experimenting with guacamole ingredients ever since my return and have concocted one I think is pretty close. Give it a shot and let me know. Until I get back to Rocco’s again, this will have to do – in the meantime, all I can say is olé! Let set a few minutes then serve with fresh chips. Store tightly covered but not for too long – it turns brown quickly.